Maria Loria arrived at Painesville, Ohio, about 1924. She migrated to Painesville from Pennsylvania with her husband, Vincenzo Pizzino, and their children. In America, Maria Loria was known as her married name, Mary Pandora. 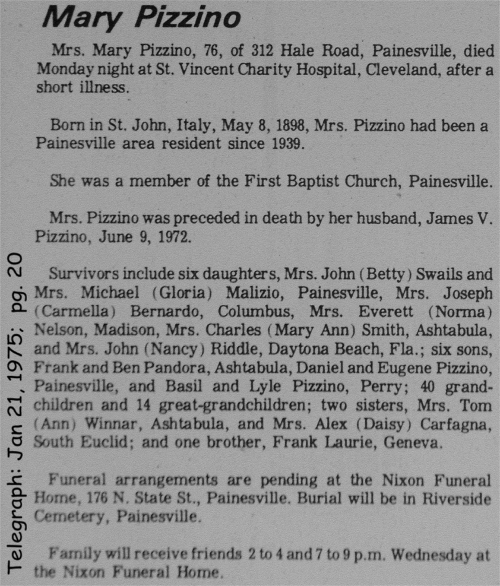 After the death of her first husband, Maria remarried and was known as Mary Pizzino. 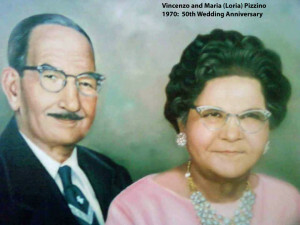 Maria’s parents, Giovanni Loria and Vittoria Tangoro, migrated to Painesville about the same time as Maria. Maria Loria, daughter of Giovanni Loria and Vittoria Tangoro, was born on Sunday May 8, 1898, at San Giovanni in Fiore, Italy. She married Beranardo Pandora on January 17, 1914, at Harrison County, West Virginia. Mr. Pandora passed away in 1918. Maria married second, Vincenzo Pizzino, son of Basilio Pizzino, on April 12, 1920. Maria died on January 20, 1975, at St. Vincent Charity Hospital, Cleveland, Cuyahoga County, Ohio, at age 76. Her body was interred at Riverside Cemetery at Painesville, Lake County, Ohio. Maria Loria, age 7, immigrated to the United States on July 19, 1905. She immigrated with her mother, Vittoria Tangoro, and sister, Teresa Loria. They were travelling to Clarksburg, West Virginia, to join Maria’s father, Giovanni Loria. When Maria’s first husband died in 1914, Maria was left a widow with three children under four years of age, and she was five month pregnant. At the time of her death, Maria resided at 312 Hale Road, Painesville Township, Lake County, Ohio. 1. Carmella Pandora was born on February 25, 1915, at West Virginia. She married Joseph Bernardo. Carmella died on January 27, 1997, at age 81. 2. Victoria Pandora was born about 1917, at West Virginia. 3. Frank T. Pandora was born on September 25, 1917, at West Virginia. He married Mary M. Czop, daughter of Peter Czop and Esther Dorfel. Frank died in 1988. 4. Ben J. Pandora was born on February 6, 1919, at West Virginia. He married Mayme Prezioso, daughter of Felice Preziuso and Giovanna DiBiase, in 1947, at Painesville, Lake County, Ohio. Ben died on February 25, 2004, at Ashtabula County Medical Center, Ashtabula, Ashtabula County, West Virginia, at age 85. His body was interred at St. Joseph Cemetery at Ashtabula, Ashtabula County, Ohio. 1. Eugene Pizzino was born on March 26, 1921, at Pennsylvania. He died in September, 1985, at age 64. 2. Daniel Pizzino was born on February 16, 1923, at Mercer, Mercer County, Pennsylvania. He married Jane Kelly, daughter of Albert and Alice Kelly. Daniel died on January 18, 2004, at Heather Hill, Chardon, Geauga County, Ohio, at age 80. His body was interred at Riverside Cemetery at Painesville, Lake County, Ohio. 3. Basil Pizzino was born on March 5, 1925, at Ohio. Basil died on October 20, 1987, at age 62. His body was interred at Perry Cemetery at Perry, Lake County, Ohio. 4. Gloria I. Pizzino was born on April 14, 1927, at Ohio. She married Michael F. Malizio, son of Palmerino Malizia and Maria Donata DiIorio, on January 24, 1953, at Lake County, Ohio. 5. Betty Jane Pizzino was born on September 9, 1929, at Ohio. She married John I. Swails on June 6, 1955. 6. Lyle William Pizzino was born on June 14, 1931. He married Clytie Evelyn Willis on April 23, 1955, at Perry Baptist Church, Perry, Lake County, Ohio. 7. 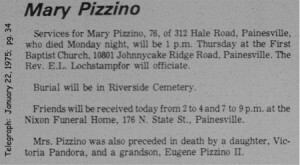 Mary Ann Pizzino was born about 1936, at Ohio. She married Charles Smith. 8. Norma L. Pizzino was born on June 18, 1937, at Ohio. She married Everett B. Nelson, son of Bryan Nelson and Myrtle Fyrlice, on December 6, 1952, at Lake County, Ohio. 9. 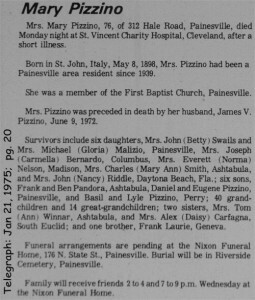 Nancy C. Pizzino was born on April 2, 1941, at Painesville, Lake County, Ohio. She married John Riddle. Nancy died on July 1, 2014, at TriPoint Medical Center, Concord Township, Lake County, Ohio, at age 73. Her body was interred at Riverside Cemetery at Painesville, Lake County, Ohio.